Love the way the end of the sleeve is cut off…his thick curly locks are sublime! I love your comments , you must be such a joy to be around. Always ( most of the times) you only see the good and so supportive. Me on the other hand …..I am a bit more critical ….terrible is a word I use. Garry…thank you kindly…it just “joie de vivre”…I love reading all of the comments and critiques here on the blog! Perhaps his taste is too sophisticated for me. I see the potential, but not the realization. He obviously wished to make a statement, as evidenced by the neckerchief, but didn’t carry through. I’m also not wild about the “spring” jacket and the “fall” pants. But, I’m happy that he’s happy, and I hope you are, too. Later. To me, part of modern dressing is thinking beyond the traditional (American)”rules”. A very thin, loose, cashmere tee shirt might be perfect for a summer day. Just as several layers of pastel cottons might keep you toasty in a blizzard. Excellent style often includes using/wearing things in new ways. If you follow ALL of the rules you end up looking simply boring! Bob is right…no more old-school thinking in fashion…that’s so very last season! I agree with countyd. I don’t know what he’s trying to do with this combination but he seems pleased with it. Wonder what his footwear is…espadrilles with socks? I like the bright yellow, and it is toned down with grey. Great. Unlike countyd’s opinion, I didn’t think of the seasonal elements in the fellow’s outfit. 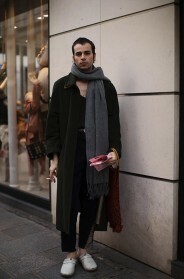 I like the textural variations, the colour contrasts and the 1950s atmosphere of his look. Although the jacket is a bright hue it feels relaxed. Yes, I am fussy about mixing seasons too. So love the top part, and love the bottom part, but separately. However, let’s face it, he is wonderful to contemplate. The parts are beautiful, the whole is a grand confusion. Oh my…for a moment I thought he wasn’t wearing any kind of shirt or blouse! All fashion “rules” get broken, and that applies to mixing items from different seasons too! Perhaps his taste is too sophisticated for me. Sometimes you go with whatever’s not in the laundry hamper. I was just scrolling through my reader and the yellow of the shirt stopped me dead. I’m not a fashion expert, but I love the composition, colors and textures of this pic. For some inexplicable reason, I do not think I would look as good as he does if I wore the same outfit. Sometimes the man does make the clothes. Bob, you misunderstand me. Breaking rules is my mission and delight. However, when you do break them, you must leave no doubt that you did so on purpose, and not from carelessness. My oft-worn breakfast-with friends is my huge toggle coat, track pants with a large red stripe, and white leather sneaks sans socks. To all but the totally lost, it’s obvious that I am aware I have on summer footwear with a winter coat. One can be born with innate style (sadly, not me) and look good in anything. no one can be well-dressed accidentally. It takes work. Not so much money, but work. If you put yourself out there, put in the work. Check my comment from Sart’s great photo dated Nov 21, 2017. she changed seasons, but dii it well, and I applauded her. I’d take her to breakfast proudly. break the rules, but do so with wit and irony. just saying’. Love the casual slacks that fit just right, and the bold look in his eye. I simply loved this yellow and the scarf! The yellow jacket is a show-stopper with its frayed edges and tear above the beltline: very wabi sabi, the Japanese concept of beauty in imperfection and transience. 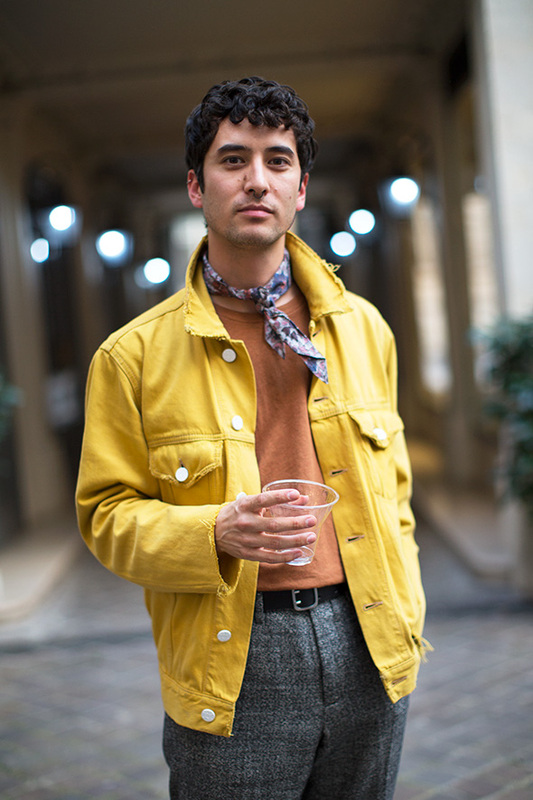 eI simply loved this yellow and the scarf!